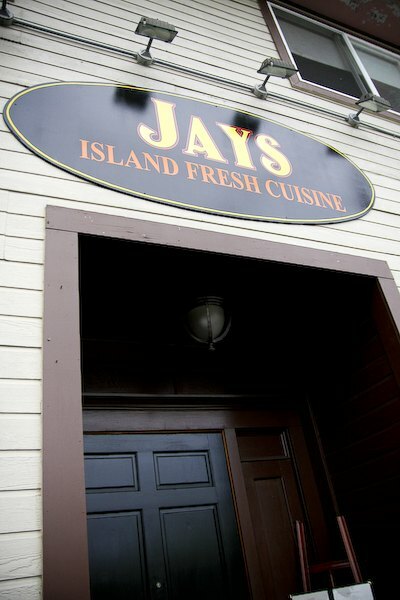 This is the old Nichols Public House location, now transformed to Jays Island Fresh Cuisine (or Jays Island Fresh Tapas). Although it was sad that Nichols had to leave this location, it’s nice to see a great new restaurant with focus on good food. 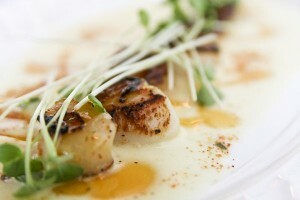 Perfectly cooked sweet seared scallops with a beautiful rich buttery lilikoi sauce. The shichimi provided a nice little kick. Super ono! I just wish the scallops were a little bigger. These were good too and the salad was very fresh. 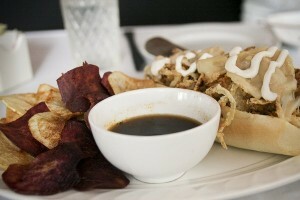 Tender prime rib, rich au jus, great homemade chips. 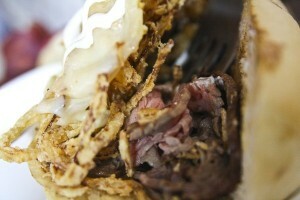 This tasted really fresh and I loved the onion rings too. Yum. Our waitress recommended the lobster ravioli for dinner. Great food here. Service was very nice and fast. Ambience was really nice and simple with some cool hip jazzy music in the background. I hope this place stays here in Hilo! Currently BYOB, no corking fee. There is a nearby wine store (Grapes) just a few stores down. This entry was posted by James on Wednesday, October 22nd, 2008 at 4:28 pm	and is filed under Other. You can follow any responses to this entry through the RSS 2.0 feed. You can leave a response, or trackback from your own site. Nice looking menu. Too bad restaurants have a tough time in Hilo. Still a sleepy little town. Hopefully the locals and everyone else opens their eyes and more importantly, their wallets to this place…. wow brah…da prices pretty manini eh? Thanks! I went there with a girlfriend and we had the steamed clams and chicken satay (two appetizers) for lunch. Really delicious! The only down side is they only had fountain soda (coke, sierra mist)- nothing original like Cafe Pesto and their limeade, etc. True they don’t have a liquor license, but having original non-alcoholic cocktails and juices would have been good. Anyway, the atmosphere was nice and food was good. We decided to go again to try out the rest of the appetizers! Went here once… won’t ever go again. Had the “prime rib” sandwich and It tasted like dried out roast beef that was just microwaved and then had some au jus added on top. Never again will I eat there. My wife was also VERY disappointed. I have been coming to Hilo on a monthly basis for the past several months and have found myself eating at Cafe Pesto often because I was not able to find any other decent place; Pesto is good, safe, and always busy. This will happen no more! Thanks to your website I tried Jay’s on 12/9 and was very impressed. The location and decor are fine; hard to park if you are driving and interior decor is nothing exciting (except for some of the modern art on the wall) but well organized and very clean. 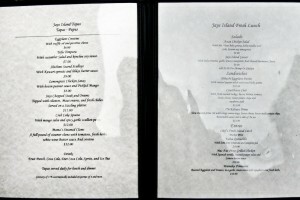 The style of the menu does not, at all, reflect the exciting dishes that come out of the kitchen; wow! 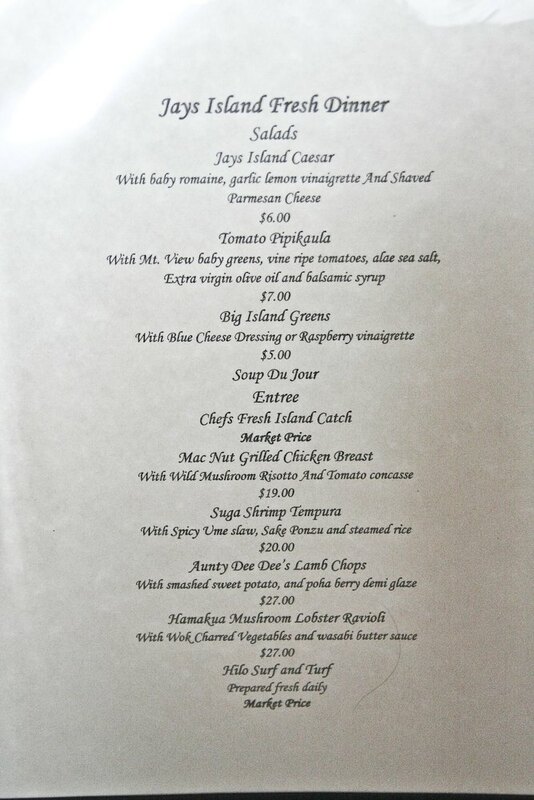 The menu was printed on someone’s computer and does not do the dishes created justice; read, they need a graphic artist. 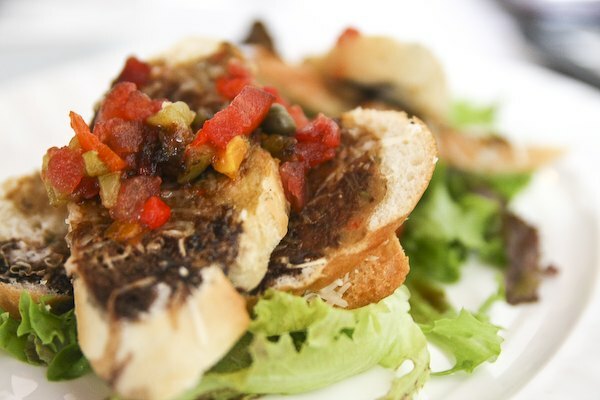 Then there is the food that is really well executed, balanced, inventive, interesting to look at and most importantly, great to taste; every bite. 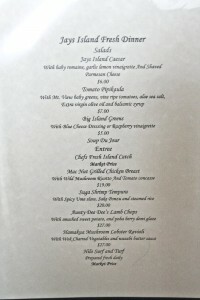 I don t have much time to write a better review but can only say that the decor, menu, and other minor aspects of the experience do not properly reflect the quality of the food that comes out of the kitchen and hence, do not judge this book by the cover because you will be missing one of the best restauarnts in Hilo. Wow! Was the write up written in the local food mag misguided!! This retaurant seems to have a great chef. Unfortunately the service was some of the worst in my 18 years on the big island. We couldn’t believe how long it took for them to do anything. it seems that every one “shares” the tables @ Jay’s( shares in the neglect). the waitstaff even made comments to how badly they were doing. Only a few of the menu items were off,I.E. out of 3 things when we first walked in the door & the french onion soup had obviously been sitting on too high of a flame getting more & more salty. We were being so ignored that we eventually had to ask if they had a corkscrew to open our 2nd bottle of wine & the waiter actually brought one & slapped it on the table & walked away, for us to open our own bottle! The tapas menu idea is a nice idea , but we were in the middle of ordering our second round of them & the waitress told us that she’d be right back and had to do something. she then proceeded to do about 3 more things while we watched here, mouth’s agape. She eventually drifted back to take our order in about 5 minutes. after looking around Hilo and only being directed to two Italian places we were on our way and noticed Jay’s sign. The outside was plain, the curtains drawn so it did not look “inviting”. a young couple leaving recomended we try it. 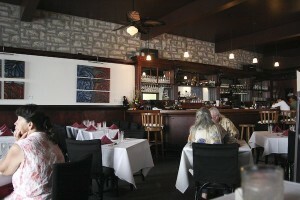 The interior is clean, well dressed, welcoming and feels upscale for a young resteraunt. the only major change I would make is to add a barrier wall to the kitchen / restroom entrances to seperate them from the dinning room, but it was not distracting. we were greated and seated promptly. there were enough people inside to suggest a good resteraunt. The bartender turned out to be the owner / chef filling in at the bar. Jay made the rounds to all the tables and it was clear most of the patrons were return customers. when it was our turn to visit with Jay we found him to be genuinly interested in making our dinning experience unforgettable without being overboard, we were not disapointed at all. We started with a Poke not on the menu, it was very different from others I have eaten, my wife reluctantly tried it,(not a fish person) then I thought I would not get another bite. Lulu had tempera shrimp off the menu. large, crispy all around, did not get soggy at all. the dipping sauce was very lively as well but I could not tell what was in it, Lulu could and loved it. I had Ahi, the fresh catch, the butter lemon sauce was the best I have ever had and wish I could duplicate it. The entire meal flavors were a great blend of influences with a wonderful balance of flavors. We finished with a passion fruit glazed cheescake, the glaze was very flavorful and jumped right off the subtle smooth rich cake. I will overlook any parking and the low key exterior and eat there often. The waitress was very friendly and knowlagable, she could use some formal training to polish up the skills of a formal server. I recomend Jay’s Island Fresh to anyone. 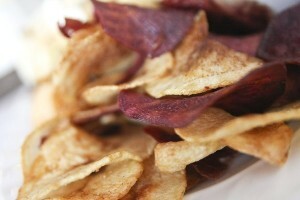 Be sure to post your reviews at http://tinyurl.com/26okadh and tell us more! 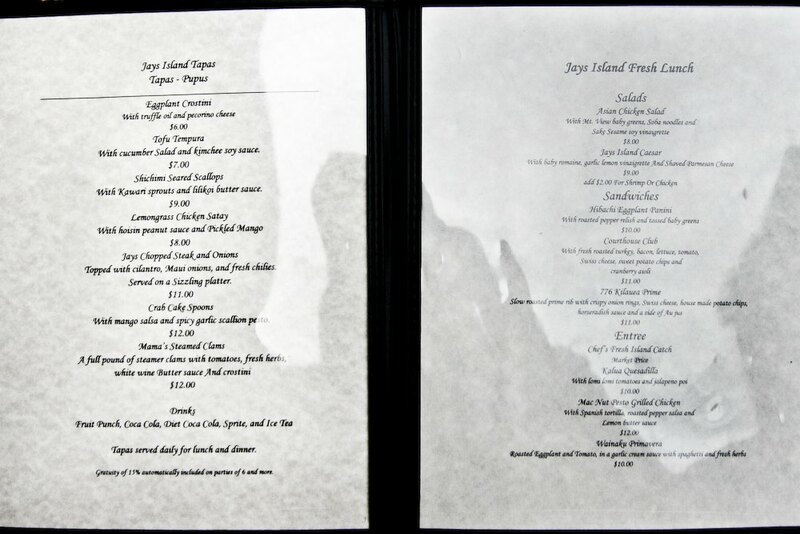 I thought Jays Island Tapas was a spectacular place to eat. Lunch time was pretty reasonable 10 to 12 dollars and presentation and taste of food was fabulous. Jays sold his business to the Hilo Burger Joint, what a disappointment. I’m really impressed along with your writing abilities and also with the layout in your blog. Is this a paid subject matter or did you customize it yourself? Anyway stay up the nice high quality writing, it is uncommon to peer a nice weblog like this one these days..
Hello there, I discovered your site by way of Google even as looking for a similar matter, your website got here up, it looks great. I’ve bookmarked to favourites|added to bookmarks. may not give you the long-term rewards you were looking for. cuticles and nails. Some of the skin problems that you might encounter during your pregnancy are:. that lifts the face by toning facial muscles, like giving your face a good ‘workout’.